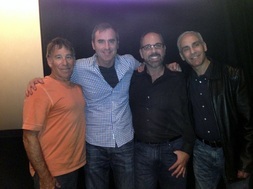 L-R: Stephen Schwartz, Adrian Bewley, Richard Castle, Matthew Levine after our first act was performed at DreamWorks Animation Studios. The Angel of Painted Post, a musical I'm composing music for from a book by Adrian Bewley and lyrics by Richard Castle, performed our first act at the 2014 ASCAP/DreamWorks Musical Theater Workshop at DreamWorks Animation Studios in Burbank. Ours was one of three musicals picked by Stephen Schwartz out of 130 submissions. 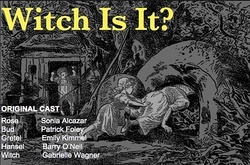 The story takes place in 1948 where a teenage girl wakes up from a coma only to find that her resourceful mother, who's husband left her with no way to support her and her daughter, is charging admission for folks to see the vision of the Virgin Mary which appears in her daughter's bedroom window. The vision attracts a young drifter, who gets caught up in a web of lies that test the faith of everyone in this war-weary town of Painted Post, Massachusetts. Patrons trickle into the American Folklore Theater to see the moving, yet riotously funny Packer Fans from Outer Space. 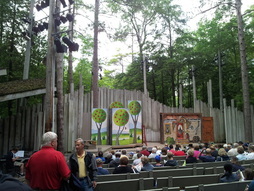 Richard Castle and I were invited by Jeff Herbst, the musical director of the American FolkLore Theater, to fly to Fish Creek, Wisconsin all-expenses paid to see their outdoor theater which is in the middle of Peninsula State Park. Earlier that year, we had written several audition pieces (along with 5 other writing teams) for Jeff who flew us and one other team to experience their 650-seat theater, their audience, and their shows which have been packing them in for over 20 years. Here's a video of our trip. Richard Castle and I had our song Witch's Curse performed by Shannon Martinous at A Little New Music, one of LA's premier cabaret events held several times a year at the Rockwell Table & Stage in Hollywood. The song was part of our 15-minute musical.